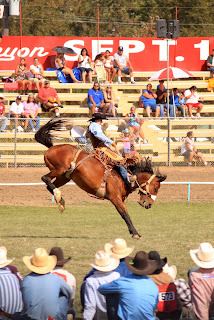 The Pendleton Round Up wouldn't be anything, if it weren't for the cowboys. They ride, buck, rope, wrestle, and run their way through 5 days of rodeo and performances. Hard work, sweat, a good horse, a good draw and a good shot of luck can make or break you. Every cowboy and cowgirl who shows up to Pendleton does so because they believe that the Western lifestyle is one worth living. And because they showed up to win. I think those who showed up 102 years ago for the 1st Round Up were probably the same way. Darcy, you make Cyclone Tailgating look like child's play compared to the Round Up. It's on our bucket list! !